Adding just the right mixture of signaling molecules—proteins involved in development—to human stem cells can coax them to resemble somites, which are groups of cells that give rise to skeletal muscles, bones, and cartilage in developing embryos. The somites-in-a-dish then have the potential to generate these cell types in the lab, according to new research led by senior author April Pyle at the Eli and Edythe Broad Center of Regenerative Medicine and Stem Cell Research at UCLA. Pluripotent stem cells, by definition, can become any type of cell in the body, but researchers have struggled to guide them to produce certain tissues, including muscle. In developing human embryos, muscle cells—as well as the bone and cartilage of vertebrae and ribs, among other cell types—arise from small clusters of cells called somites. 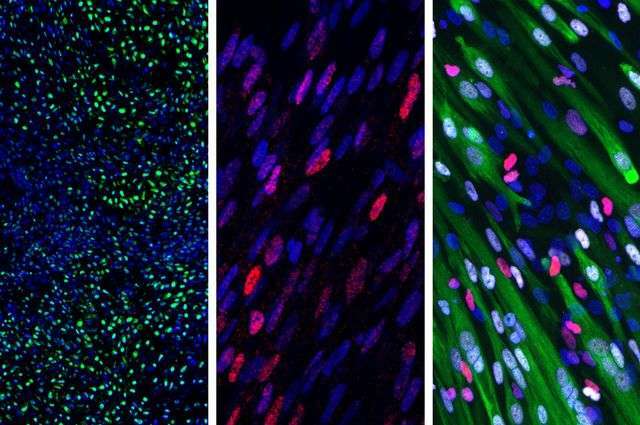 The new protocol to create somite-like cells from human pluripotent stem cells opens the door to researchers who want to make muscle, bone and cartilage cells in the lab. Pyle's group plans to study how to use muscle cells generated from the new somites to treat Duchenne muscular dystrophy, a severe form of muscle degeneration that currently does not have a cure.